These modular welding systems feature the F Series robot arm and C-Controller with Met-Fab Interface. The Type I Mini-Cell features a dual stationary 30x40 in. work table, manually operated steel roll doors, dual pushbutton stations, and an arc light shield between stations. 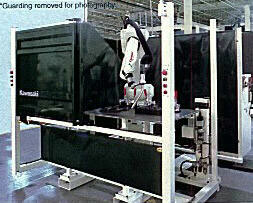 Standard equipment of the Mini-Cells includes a FS06L or FS10L robot and robot riser, C-Controller with Multi-Function Panel, AS Language and Block Step capability, word processor capable, air-cooled MIG gun with breakaway mount, Miller AutoInvision Mig Welding System, perimeter frame-mounted fence solid panels, and more. The Mini-Cells can be tailored from among options including water-cooled Mig gun, pneumatic actuated steel rolling doors, automatic weld wire trimmer, and laser-guided vision and seam tracking systems.